Lightness is key to the pleasures released by this otherwise sinfully prepared breakfast. The scrumptious filling was also kept creamy and caloricly light...by using bittersweet chocolate and partially non-fat milk.
. CREPE BATTER: In a blender, place all DRY ingredients first. Then, add all the WET ingredients on top. Pulse the mix a few times before swirling it until smooth...not more than a minute. Note: the batter renders a very liquid consistency! Pour the batter into a deep bowl with a small accompanying ladle. Set aside if possible for an hour to let the flour expand. Meanwhile, if desired, prepare the filling *.
. COOK the CREPES: Prepare two big side plates to shelter the crepes as they're all being cooked. This will keep them from drying and hardening. Pre-heat a lightly greased non-stick skillet (8in/20cm) pan at medium heat. Note: depending on your stove's strength...after the first crepe, you might need to adjust down the heat very slightly. Each crepe should require about the amount filling the small ladle. If using a bigger ladle...only fill it halfway. Pour and swirl the batter into the skillet with one quick motion from side to side and around. Note: If you've never made crepes before, a little practice may be had on the first few tries...don't despair. When the batter starts showing surface bubbles and it starts lifting slowly from the sides...it will be time to carefully nudge the crepe from the perimeter and flip it. Cook it mildly (30 seconds) on the reverse side. Take it off the skillet and place it in between the two side dishes. Repeat the process.
. * FILLING for crepes: (It is best to do this step before cooking the crepes). In a small-medium bowl, place the coarsely chopped chocolate and milk together. Microwave it for 30 seconds. Take it out and let it rest for another 30 seconds before smoothly stirring it with a small spatula. Set aside. In another medium bowl, cream together the ricotta, vanilla, and maple syrup until smooth. Add most of the crushed roasted almonds and reserve some for garnish later. Very gradually add most of the melted chocolate to the ricotta mix and blend. Note: to avoid the chocolate from ceasing and clumping, it is important that you don't rush this step. Remember...if desired...reserve a little melted chocolate for decor on the platter.
. 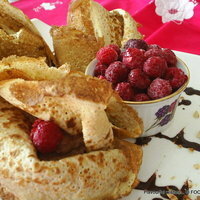 ASSEMBLY and PRESENTATION: Place a heaping spoonful of filling on one side of each crepe and fold once. Repeat for each one. . Plate each flower-like crepe by standing the folded part down...turning the bottom ends inwards and then slightly flipping the vertical edges to their sides.
. SERVE: with raspberries...a sprinkle of remaining roasted almonds...and a little extra Maple syrup. This sounds really interesting. Love the Ricotta,nuts and fruits all perfect with crepes.